If I had to choose my taste preference in food, it would be spicy. I have gone head-to-head with some seriously spicy dishes in the past, sometimes out of curiosity, and other times, as a challenge. I have even embarrassed myself on a second date trying to be a heat hero while setting fire to my mouth eating some of most ridiculously spicy beef vindaloo I have ever had (seriously, the restaurant owner sat by our table with a pitcher of water and a grin on his face as he watched this go down). I guess I didn’t fare too badly — my husband and I are still together 13 years later (and that moment is still just as memorable to this day). Jalapeño peppers, while not the spiciest of peppers (about 2,500-10,000 Scoville units), are one of my favourite peppers to eat and add to dishes. There’s a nice touch of heat with the pleasant flavour of the pepper that makes me reach for it when I need to add some punch to my food. 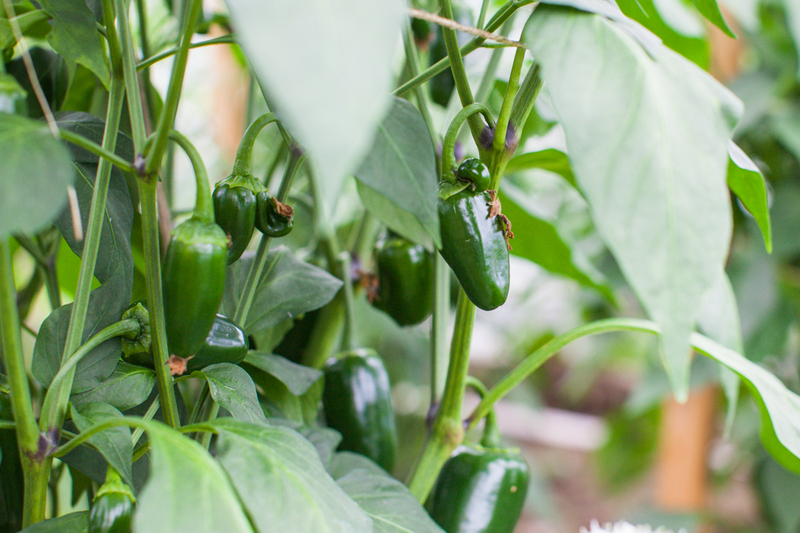 I was fortunate to have access to my parents’ bumper crop of jalapeños, courtesy of my dad’s awesome greenhouse. But what to do with so many of this delicious pepper? After a bit of humming (and some more hawing), I decided pickling them as a nice crunchy side dish would allow me to enjoy and savour them for a much longer time than anything else I could think of. Being Korean, having side dishes (banchan; 반찬) to accompany my main meals has always been a part of growing up but as my cooking is more predominantly outside of Korean influence, the concept of having banchan with meals has fallen by the wayside. Well, no longer is that the case. Now, I can have my banchan and eat it too! Pickling the jalapeños is a great happy medium for a household that likes spicy dishes but a) has a young child that can’t tolerate everything being spicy, all the time; and b) having a husband who isn’t crazy about the aftermath of odours that is left with kimchi consumption. At some point, I have plans of canning but these have not been prepared with proper canning procedures. I figure the acidity of the vinegar and the spiciness of the peppers doesn’t leave the environment too conducive to bacterial growth. But as a precaution, I have an extra refrigerator in the basement where I can store my extra stash, just to be on the safe side. In any case, as a disclaimer to the recipe, the appropriate way to store these would be as if they have been already opened. So, refrigerate and consume in a month or less. A note on prep time: I had about 80-100 jalapeños to prep. That’s a lot of pepper so it probably took me somewhere in the realm of 30-45 minutes to slice those all. I tried to scale the prep time down appropriately but your mileage will vary. Add vinegar, water, sugar, and salt to a pot and bring to a boil. Slice the jalapeño peppers, discarding the stems (be careful not to come into frequent contact with the inside of the pepper or the seeds and wash your hands well afterward; or save yourself the trouble and wear disposable kitchen gloves). Peel the garlic cloves and give them a good smash with the blade of your knife. 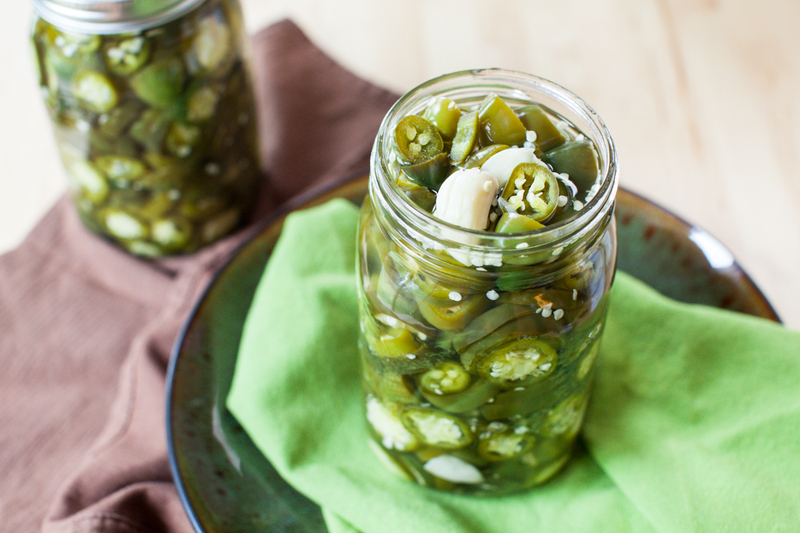 Once the pickling liquid is at a rolling boil, add the jalapeño slices fully immersing them in the liquid, cover, and turn off the heat for 15 minutes. Carefully place jalapeños in a 1L jar (I use canning jars with the two-piece canning lids) and pour the hot liquid over the slices. Cover with lid and let it cool before refrigerating. Aaand for your final step… eat with everything!